LOS ANGELES, California (CNN) -- It was described as one of the most grisly scenes Los Angeles police had ever encountered: the bodies of five small children and their parents, all shot to death, in two upstairs rooms of the family's home. "The reaction on their faces was not a pretty sight," neighbor Jasmine Gomez told CNN. "There was an officer who came out of the house throwing up." But even more incomprehensible to some was the story that emerged after the bodies were found Tuesday: A father who, after he and his wife were fired from their jobs, killed all six family members before turning the gun on himself. Lupoe, 40, claimed the couple was being investigated for "misrepresentation of our employment to an outside agency for the benefit to ourselves's [sic], childcare." He said the initial interview was held on December 19, and when he reported for work on December 23, "I was told by my administrator ... that 'You should not even have bothered to come to work today. You should have blown your brains out.'" "Oh lord, my God," the letter concludes. "Is there no hope for a widow's son?" Kaiser Permanente said in a statement Tuesday night that while the company is "saddened by the despair in Mr. Lupoe's letter faxed to the media ... we are confident that no one told him to take his own life or the lives of his family." The Lupoes' employment was terminated over a week ago "after an internal investigation," the company said. "While we may never fully understand why today's senseless deaths occurred, everyone who worked with the Lupoes is shocked and terribly saddened by the tragedy," said the statement. "It never should have happened." Lupoe wrote in the fax, "after a horrendous ordeal, my wife felt it better to end our lives; and why leave our children in someone else's hands ... we have no job and 5 children under 8 years with no place to go. So here we are." Ana Elizabeth Lupoe was 38, according to the Los Angeles County coroner's office. The children were identified as 8-year-old Brittney Nicole; 5-year-old twins Jaszmin Lissette and Jassely Lisbeth; and 2-year-old twins Christian De Shawn and Benjamin Ryan. Lupoe and the girls were found in what appeared to be an upstairs bonus room, police said Wednesday. Ana Lupoe and the boys were found in the master bedroom. Police believe Lupoe also called KABC and threatened suicide, prompting the station to notify police. At about the same time KABC contacted police, Lupoe called 911 and reported returning home and finding his family dead, authorities said. Among those struggling to comprehend the news was Lupoe's 83-year-old grandmother, Josephine Lupoe of Atlanta, Georgia. She sobbed as she told CNN, "I just can't believe it." She said Lupoe was born in Atlanta, but moved to Detroit, Michigan, with his parents as a child before moving to California. She recalled visiting the family when they lived in San Jose, California, "but that was years ago," she said. "I hadn't been to visit them since he got married and moved." She said she last heard from him when he called her to say they were having a second set of twins. "Every time I called, he was at work," Josephine Lupoe said. "He worked a lot, and even when I talked with him, he would be at work." But she said she had no indication of problems within the family. She said she spoke with Lupoe's mother a couple of days ago, and they discussed his sending pictures of the boys. "And then I hear this," she said tearfully. Lupoe's mother was traveling to California on Wednesday, she said, but Josephine Lupoe said she is unable to travel. Lupoe's co-workers told the Los Angeles Times they remembered the Lupoes as cheerful, good workers and caring parents. Ana Lupoe was "always talking about the kids," said co-worker Hamlet Narvaez. 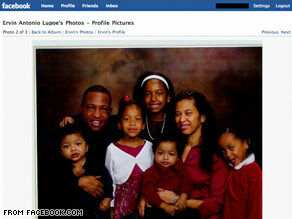 On Ervin Lupoe's Facebook page, which previously displayed pictures of the family, he describes himself as a graduate of the University of Southern California. The page could not be found Wednesday. In a written statement, Facebook spokeswoman Rebecca Hahn told CNN, "When it comes to our attention that a user has passed away, we put the profile in a memorial state. In the memorial state, certain profile sections and features are hidden from view to protect the privacy of the departed. We encourage users to utilize groups and group discussions to mourn and remember the deceased." Cherise Pounders-Caver, principal of the children's school, Crescent Heights Elementary, said Lupoe showed up to check the three older children out of school about two weeks ago and told her the family was moving to Kansas, the Times reported. Police said Wednesday school administrators were notified "several weeks prior" to the deaths that the children would no longer be attending. "No matter how desperate you are, no matter how frustrated you are, to think this was the only answer -- to take your whole family with you in death -- is just too much to understand," said City Councilwoman Janice Hahn, who represents the city's Wilmington neighborhood where the slayings took place. She and other city officials urged those who may be despondent to seek help from available resources. "It's sad that this happens anywhere, you know?" neighbor Jose Rodriguez told KABC. "You see it on the news but you never really become accustomed to it. "I have kids, too, and grandkids," he said. "It hits home." CNN's Stan Wilson, Ashley Broughton and Paul Vercammen contributed to this report.